Youths should take up these opportunities as they come. 16:30 – President Mnangagwa says there are also opportunities for youths in the agriculture sector which are supported by Government. These include fishing under the Command Livestock programme. 16:28 – President Mnangagwa says small businesses should grow to become big businesses. In the mining sector President Mnangagwa advises youths to work as groups since their ministry was already acquiring equipment for them. 16:26 – He says the youth Empowerment bank has been been given US$12 million dollars for youth projects. He also says government has put aside funds for small businesses. 16:24 – YOUTH EMPOWERMENT: President Mnangagwa says the youths are the future and they should be empowered. 16:20 – He says after today’s event his next stop over should be an interface with varsity students. 16:19 – President Mnangagwa says he was impressed by the youths leadership and the way it’s running its affairs. “I was happy to hear that Kazembe Kazembe is doing well,” said the President. 16:12 – President Mnangagwa says leaders of the people should come from the people. He hails Tsenengamu for accepting defeat in the recent primary elections. He says people should not win using tricks but through working hard for the people. 16:09: CORRUPTION: Government should fight corruption day and night. Government should fight night corruption day and night . He says it is everyone’s duty be committed to hardwork and honest. 16:07 – President Mnangagwa says under the new dispensation they have brought back the party to tow the correct line of the revolution by going back to the people and listen to their challenges and concerns. 16:05 – President Mnangagwa says the upcoming 30 July elections must be free and fair. There is no need to be violent on the very same people from who we want votes. 15:59 – Government is prioritizing business and economics as we draw closer to elections. US$16 BILLION DOLLAR INVESTMENT: President Mnangagwa says meanwhile US$16 billion dollar investment has been secured. 15:56 – Meanwhile China has also availed US$1 billion dollars for the upgrade of Hwange Power station. President Mnangagwa says it is Government’s wish to see people living a decent life. 15;52 – YOUTH PARTICIPATION IN MINING: President Mnangagwa says there is need for youths to participate in mining. He says when he went to China President Xi agreed to release US$100 million for mining, and this has been fulfilled. 15:51 – ZISCO STEEL: President Mnangagwa says to revive the country’s economy, Zisco should be resuscitated. On the other side, the industry in Bulawayo is dead and Government is attracting foreign investors to breathe life into the economy.
. He says the leadership is putting up programmes that modernise the country’s education and agriculture sectors. President Mnangagwa says the current dispensation agreed that in the next twelve years Zimbabwe will be a middle-income country. 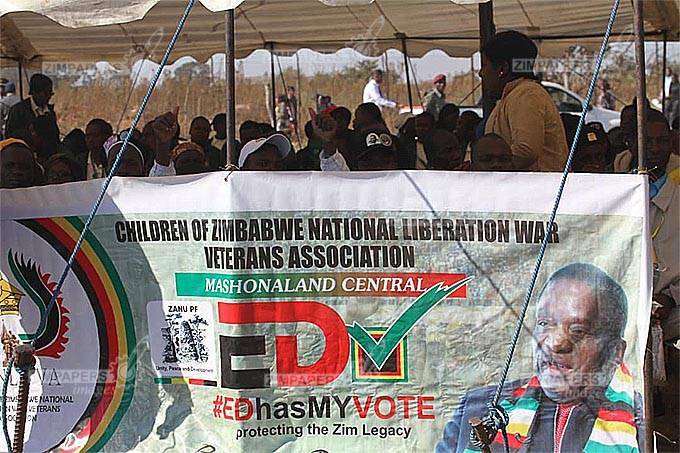 15:46 – President Mnangagwa says the youths should protect the country’s heritage by voting for the party that brought independence. He says Zanu PF is the only party that knows the tribulations and suffering that brought independence. 15:40 – He says the country needs both foreign and local investment. President Mnangagwa says the next interface was with the national war veterans. 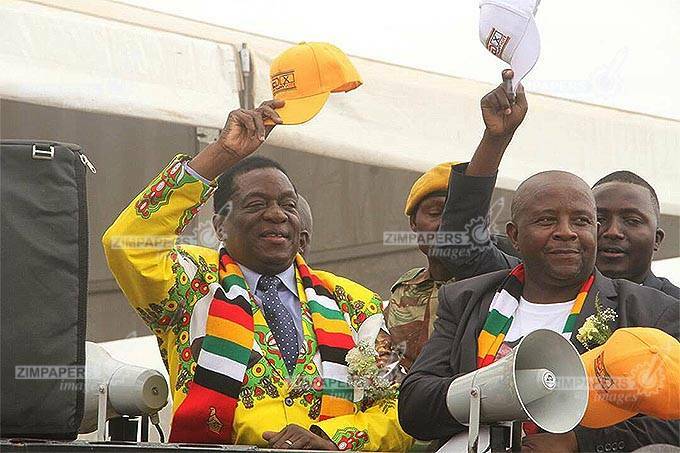 15:39 – President Mnangagwa says so far he has met the Chiefs and also interfaced with captains of industry and impressed upon them the need to focus more on reviving the country’s economy. 15:37 – He says the youths should follow the party ideology and how the leadership of the party looked after the country’s heritage. 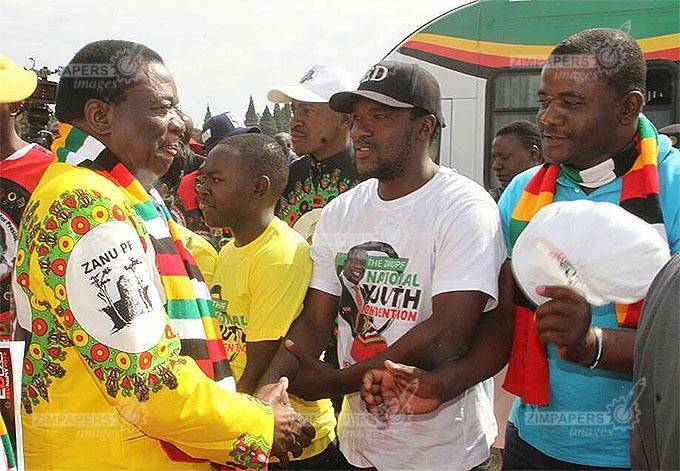 15:37 – President Mnangagwa says this is his first time to meet the youths as President. He says after such a meeting like this he gets an opportunity to outline his vision. 15:35 – President Mnangagwa says he is happy to have been invited by the youths. He says he is impressed by the huge turnout and goes on to says the voice of the people is the voice of God. 15:32 – PRESIDENT MNANGAGWA’S ADDRESS: President Mnangagwa President acknowledges youth league leadership and the Vice Presidents. 15:31 – VP Chiwenga says the destiny of Zimbabwe was in the hands of Zimbabweans. Therefore the youths should follow the ruling party’s ideology. VP Chiwenga invites the President to the podium to deliver his address. 15:29 – VP Chiwenga says people should be Zanu-PF inside and out. He says people should be patient with President Mnangagwa’s policies. He says no-one needs to be reminded the pain President Mnangagwa endured during the interface rallies held last year. He says the country requires that people work for it with integrity. 15:23 – He said the new leadership of Ed has brought a sense of renewal characterised by humility and respect. 15:21 – VP Chiwenga says President Mnangagwa should be given the chance to fix the country’s problems and create the much needed jobs. In doing so, party members should remain loyal.
. Under the visionary leadership President Mnangagwa the country is working towards regaining the region’s breadbasket status. 15:17 – POLITICAL PROVOCATION: – VP Chiwenga says youth should shun violence even when provoked. 15:16 – VP Chiwenga says Zanu-Pf values include respect and tolerance.He says youths should show respect beyond the party even in traditional circles. 15:13 – He says its a mental disability to think the struggle was a stroll in the park. He says the youths should therefore perpetute Zanu PF’s values through their deeds. 15:12 – VP Chiwenga says in a new Zimbabwe there must not be any room for selfish people. He says people should be driven by patriotism for their country. 15:10 – VP Chiwenga says the liberation war was executed by the youths. He adss that today the war is now assymetric. 15:08 – He says in a new Zimbabwe we don’t want selfish people.He says people should love their country.He says people should have the spirit of the Biblical Naboth who refused to sell the land of his fathers. He says with the youths as the vanguard nothing can stop Zimbabwe from prospering. 15;05 – VP Chiwenga says only age saved President Mnangagwa. He says like young Emerson he and others left the country to join the liberation struggle. He says during the struggle some become commanders. 15:01 – He says President Mnangagwa dedicated to serve the country. He was sentenced to death after bombing a Rhodesia train. 15:00 – VP Chiwenga says President Mnangagwa was a disciplined youth.He has therefore challenged the youths to emulate President Mnangagwa’s leadership. He says President Mnangagwa due to his prowess led the youth wing of Unip in Zambia. 14:58 – He says individuals can not carry Zanu-PF on their heads. He says President Mnangagwa as a youth skipped borders to Zambia protesting the repressive smith regime. 14:56 -He also says he wants to give a brief history about the President.He says Zanu PF like any political party is preparing for elections. 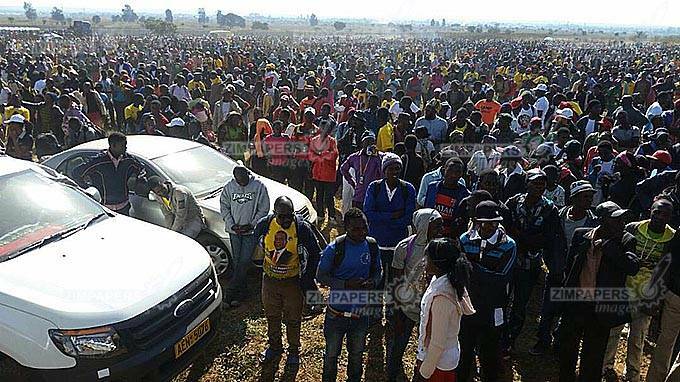 He says Zanu PF shall endure institutional eternity judging by the huge turn out and a people oriented manifesto. 14:54 – VP Chiwenga urges the youths to listen attentively to President Mnangagwa’s wise words. He hails Cde Tsenengamu for accepting defeat in the primary elections. He says that this exemplifies maturity. 14: 52 – He said the youths are the future leaders. He says the President will give in detail the history of the party and where it’s going. also says the youths must understand the wisdom of the elders. 14:51 – VP Chiwenga is now on the podium . He says that he recognizes in a special way the party’s vanguard, the youths. He says he is happy to be in Midlands and the massive turn out by the youths. 13:45 – He says they have already put it on record that Zanu PF will win the forthcoming elections. He says the whole world is happy with President Mnangagwa. He calls VP Chiwenga to the podium to introduce the President. 14:39 – Togarepi says Chamisa should not give President Mnangagwa his sister when he loses the elections but should allow her to pursue her education. Mr Chamisa earlier on insinuated that he would surrender his eighteen year old sister to President Mnangagwa if he lost the elections to him. 14:35 – Cde Togarepi says opposition parties will close shop after elections. 14:34 – Cde Togarepi says such people can never lead a nation with such kind of a playful character. 14:32 – He refers to the recent statements by opposition leader Mr Nelson Chamisa who insinuated that he had met US President Donald Trump and promised US$15 billion if he won the next elections. The US embassy in Harare however dismissed the claims as falsehoods. 14:31 – OPPOSITION UTTERANCES: Cde Togarepi condemns some utterances by opposition forces which he say are provocative whilst some are humiliating to the nation. 14:30 – He thanks the President for coing to listen to youths concerns. He says they will present their concerns in writing. Auxilia Mnangagwa. He also says the youths want peaceful elections. 14:24 – He hailed higher education minister professor Murwira for slashing fees for students on attachment by 40 percent. 14:23 – Cde Togarepi adds that a youth bank will be opened soon and members will have access to reasonable loans with no collateral. 14: 22– He says the Minister of Mines is being responsive to youths issues and also applauds Youth Minister Kazembe for creating time for them.
. He also says youths in mining are labelled makorokoza yet they are small scale miners contributing to the national fiscus. 14:15 – Cde Togarepi says in five months President Mnangagwa had mobilized US$15 billion worth of investment pledges which should benefit mainly youths on fruition. 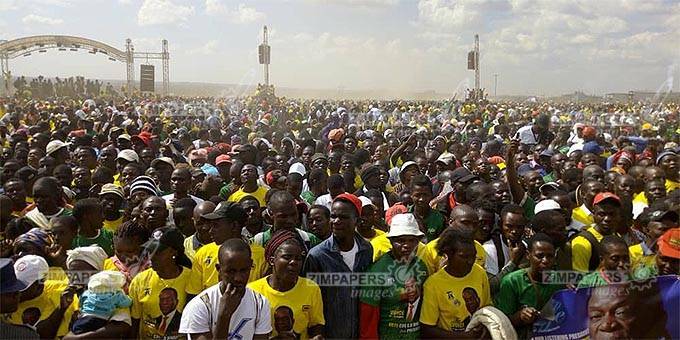 President Mnangagwa is to address the multitudes attending the Zanu-Pf YL convention this afternoon. 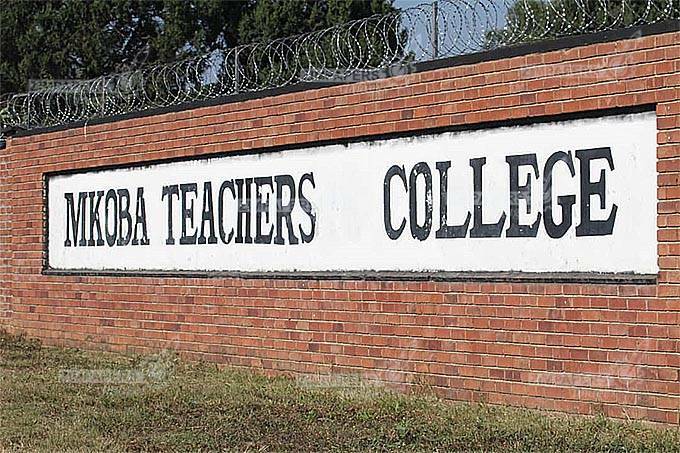 Mkoba Teachers College open grounds is the venue for the Zanu-Pf YL national convention. President Mnangagwa is the guest of honour. Today’s event was preceded by a 5km edhasmyvote fun run at Mkoba stadium in Gweru. 13:26 – Youth League affiliate organisations now giving solidarity messages.
. The organisations reaffirm unwavering support to President Mnangagwa. 13:18 – Cde Tendai Chirau who is the Zanu PF youth league national secretary for administration now outlines the agenda for today’s event. President Mnangagwa greets the crowd as he arrived at Mkoba Teachers College open grounds earlier on. 12:59 – Zanu-Pf national Chairperson Cde Oppah Muchinguri is now introducing the two Vice presidents, Cdes Kembo Mohadi and Constantino Guvheya Chiwenga. RECORD Crowd . 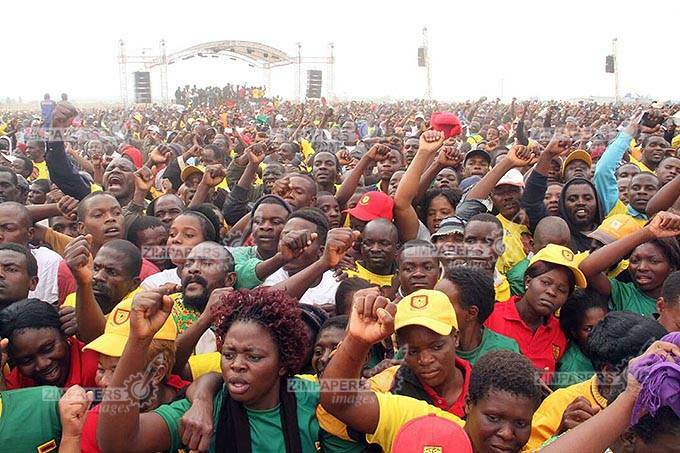 . . An estimated 30 000 have converged for the Zanu-Pf YL convention at Mkoba Teachers College open grounds, Gweru. 12:47 – Tsenengamu has finished introducing the national youth leadership and paves the way for Cde Pupurai Togarepi who comes in to introduce members of the Politburo. President Mnangagwa greets multitudes who have converged at Mkoba Teachers College open grounds for the Zanu-Pf YL convention on this afternoon. 12:38 – Tsenengamu admits that most youths lost during the recent primary elections. He goes on to introduce the Midlands provincial chairperson Cde Daniel Mackenzie Ncube. 12:37 – Lastly host chairperson Edmore Samambwa makes his slogan as Cde Tsenengamu takes to the podium to to introduce leaders of affiliate organizations. 12:35 – Kumbulani Mpofu Zanu-Pf Youth chairperson of Bulawayo, Godwin Gomwe of Harare and Tawanda Mukodza of Manicaland have also made their slogans. They are followed by Kelvin Mutsvairo of Mashonaland East and Ruwizhu of Mashonaland Central. Thousands are still streaming to the venue for President Mnangagwa’s address during today’s Zanu-Pf Youth League Convention. 12:26 – Provincial youth chairpersons are now making slogans starting with Vengesai Musengi of Mashonaland West. He is followed by Washington Nkomo of Matabeleland South and Tamuka Nyoni of Matabeleland North. 12:25 – Zanu PF youth league commissar Godwin Tsenengamu is now introducing youth chairpersons. 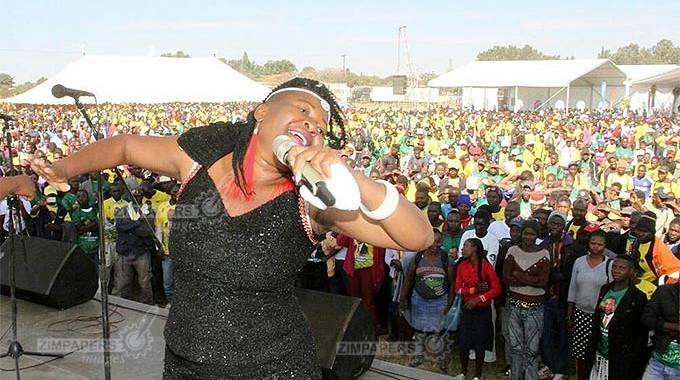 12:19 – President Mnangagwa is joined at the stage by other party officials dancing to the signature tune kutonga Kwaro by Mukudzeyi Mukombe aka Jah Prayzah. 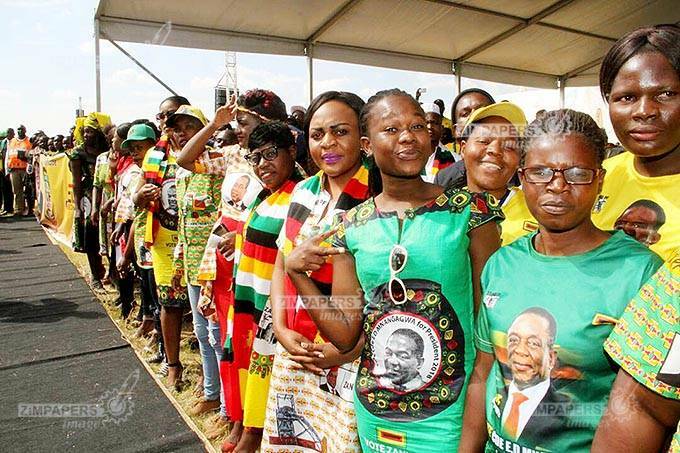 Dressed for the occasion . . .Zanu-Pf youths members parade as they welcome President Mnangagwa. 12:02 – President Mnangagwa has just come out of a briefing session and is now greeting the multitudes who have converged here. President Mnangagwa is welcomed by the Zanu-PF youth league leadership at Mkoba Teachers College open grounds ahead of his address to the thousands converged for the Youth League convention. 11:38 – His Excellency President Mnangagwa has arrived at the venue and is welcomed by the Zanu-Pf youth leadership. 11:32 – Vice presidents Kembo Mohadi and Guvheya Chiwenga have arrived at the venue.National chairperson Cde Oppah Muchinguri is already here including Politburo members Cdes Prisca Mupfumira, Machacha, July Moyo, Tsitsi Muzenda, Josiah Hungwe and Chris Mushohwe. 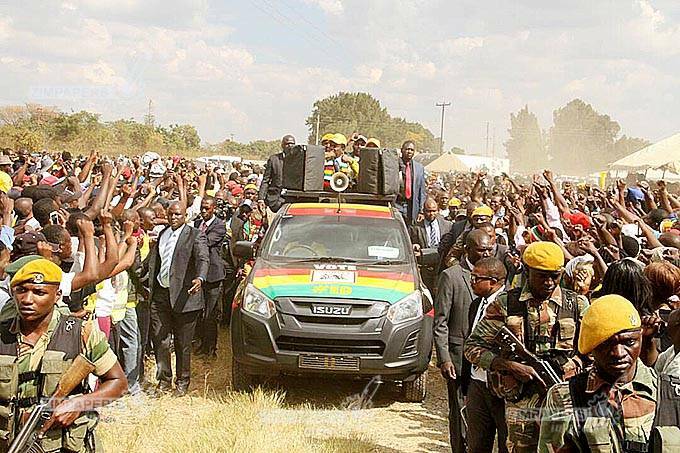 11:30 – Meanwhile President Mnangagwa has arrived in Gweru and is now expected to arrive at the venue in a few minutes. 11: 00 Bulawayo Provincial Minister of State Cde Angeline Masuku was one of the earliest officials to arrive at mkoba teachers College open grounds ahead of President Mnangagwa’s address. Thousands of youths are already here waiting for the official address. President Mnangagwa this morning addresses an expected 30 000 youths at Mkoba, Gweru during the Zanu-PF Youth League Convention. This follows the edhasmyvote 5km fun run that took place at Mkoba Stadium from 6am to 7am this morning. – Zimpapers Digital gives you live updates of this event. Stay logged in.